Characteristic aroma, bright red color, juicy texture and sweetness, strawberries are among the most popular berries. Strawberry is consumed in large quantities, either fresh or in such prepared foods as preserves, fruit juice, pies, ice creams, milkshakes, and chocolates. This fruit is rich in antioxidants and other essential nutrients that can help you reduce your risk of cancer, heart disease, inflammatory diseases, and birth defects as well as manage your weight. Read on to learn 7 surprising health benefits of strawberries. One cup of strawberries contains over 13% (3.3 grams of fiber) of the RDA of dietary fiber, most of which is soluble fiber, and only 43 calories. So it keeps your digestive system healthy and will not make you fat. One cup of strawberries contains an incredible 136% of the RDA of vitamin C, which has been proven to prevent cancer. 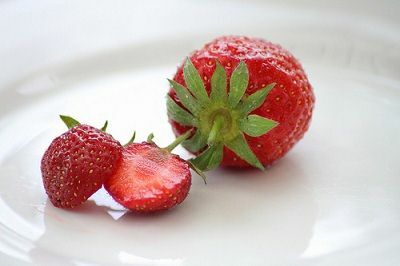 A phytochemical called ellagic acid also found in strawberries, ellagic acid has been shown to yield anti-cancer properties like suppressing cancer cell growth. Anti-cancer benefits from strawberries are best documented in the case of breast, cervical, colon, and esophageal cancer. Pregnant women are often confused as to what they should eat during pregnancy that’ll both be good for them and the baby. Folate is a B-vitamin recommended for women who are pregnant or trying to conceive, and strawberries are a good source with 21 mcg per serving. Folic acid helps the baby’s brain development and it also reduce the risk of birth defects. Strawberries contain flavonoids which are a type of phenol known to be potent antioxidants. These phenolic compounds improve blood vessel function, and decrease the tendency for blood clotting. In addition, potassium is another heart healthy nutrient, strawberries are considered a “medium source,” according to Alberta Health Services. The power of vitamin C in strawberries continues, research published in the American Journal of Clinical Nutrition shows that people who eat foods rich in vitamin C have fewer wrinkles and less age-related dry skin than those who don’t. Strawberries also contain the antioxidant ellagic acid, which protects the elastic fibers in our skin to prevent sagging.